Self Portrait. Ink on board, 1985. © The Estate of Al Hirschfeld. The name Al Hirschfeld has virtually been synonymous with Broadway since his first theatrical drawing was published in December 1926. But by then, he was a six-year veteran of movie studio publicity and art departments, having already worked for Goldwyn, Universal, Pathé, Selznick, Fox, First National, and Warner Brothers. I lived in the movies, he says of his early years, and it was in films that he discovered his gift of caricature. In this exhibtion, visitors can see Hirschfelds nine decades of film art, covering the transition from silent to sound; from black and white to color; from the studio system to the world of independents. First organized for the Academy of Motion Pictures Arts and Sciences, "Hirschfelds Hollywood" traces the development of the artist as Hirschfeld moves from early conventional eye, ear, nose and throat drawings to his signature work: a joyful, life-affirming line that communicate volumes in a single stroke of his pen. The show celebrates an artist whose works of serious graphic composition, informed by a distinctly modern aesthetic, and leavened by wit have helped to define the way Main Street America looks at the movies. the exhibition will travel to Franfurt in September. "SIDE BY SIDE: THEATER DRAWINGS FROM THE 1930S BY AL HIRSCHFELD AND BEN SOLOWEY"
More than 100 times Al Hirschfelds and Ben Soloweys work appeared side by side in the Sunday editions of The New York Times and Herald Tribune between 1929  1942. Side by side is also the way you will see works by both artists in this extraordinary exhibition to honor the Hirschfeld Centennial. Drawings of the same performers and productions; drawings that appeared on the same day. It is an unique opportunity to see pieces by the top court artists of the Broadway kingdom. 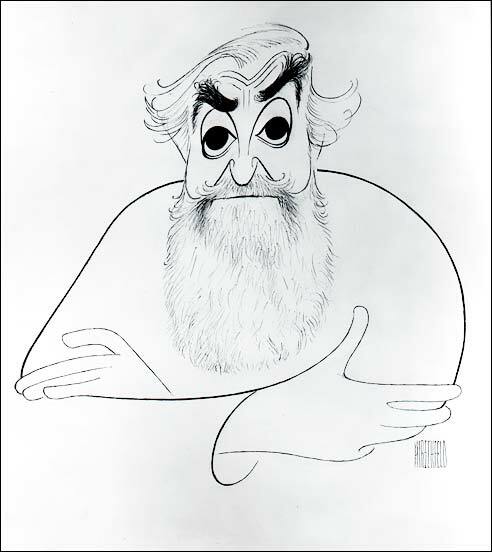 "AL HIRSCHFELD - A CENTENNIAL CELEBRATION"
The legacy of line will be honored in a showing of hundreds of digital reproductions of Al Hirschfeld's theatrical caricatures created well into his 100th year. Documentary videos will present his story and his passion for pen and ink. A digital recreation of his studio will offer a sense of this remarkable artist's private world of vast creativity. A retrospective exhibition that celebrates the draftsman's extraordinary career. The exhibition comprises nearly fifty drawings and a selection of sketchbooks by Al Hirschfeld, ranging from 1927 to 2002. In addition to portraits of actors, playwrights, and directors, various depictions of theatrical scenes, designs for book illustrations, and a self-portrait are on view. From his 1927 drawing of Ethel Waters in Africana to a depiction of Anne Bancroft in the 2002 production of Occupant, the development of Hirschfeld's signature stylea combination of exuberant line and a quick, generous witis evident in a selection of works spanning more than seventy years. Images of political subjects, including The Nazi Party Manipulates World Leaders (1939) reveal the artist's sensitivity to the world beyond Broadway and his remarkable skill as a political cartoonist. The exhibition was first presented at the Morgan Library in New York City. The works on exhibition are from the Melvin R. Seiden Collection at the Harvard Theater Collection, Houghton Library, and the Fogg Art Museum, Harvard University. "A HIRSCHFELD BIRTHDAY CELEBRATION WITH ANNE JACKSON AND ELI WALLACH"
Celebrate Hirschfeld's 100th birthday with a special afternnon with one of the greatest couples of the American stage. A special celebration to honor the renaming of the Martin Beck Theater as The Al Hirschfeld Theater. An exhibiton that celebrates Hirschfeld's extraordinary work on the lively arts of theater, dance, and opera. This brand new exhibition is arranged by personality, rather than chronology, and gives the viewer a fresh viewpoint on The Hirschfeld Century. all works are from Hirschfeld's own collection.